Will Samsung Gear 360 become the most popular 360-degree camera, taking the crown away from the Ricoh Theta S? VRandFun.com reports that the Samsung Gear 360 preorders sold out within minutes in Korea, after Samsung began accepting preorders. In the US and other regions, preorders have not officially begun, although one retailer has already begun accepting preorders. 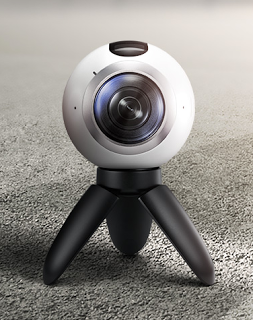 The popularity of the Samsung Gear 360 in Korea may or may not be indicative of its popularity in other regions. Samsung controls the Korean smartphone market, but in the US, the most popular smartphone is still the iPhone. Thus far, Samsung has said that the Gear 360 app, required for controlling the camera, is only compatible with high-end Samsung phones: the Galaxy S6, S6 edge, S6 edge+, S7, S7 edge, and Note 5. Technically, it is possible for Samsung to allow other phones to connect with the Gear 360. However, their tight rein on the Samsung Gear VR and the Milk VR store has shown that they are willing to have a closed system. In particular, Samsung has prevented other Android phones from running the apps on the Milk VR store. That may indicate that Samsung will likewise be unwilling to allow other phones to run the Gear 360 app.